Intersection-related crashes constitute more than 50 percent of all crashes in urban areas and more than 30 percent in rural areas. Why such high numbers? Well … consider this. Crashes often occur at intersections because these are locations where two or more roads cross each other; are often navigated by multiple drivers at the same time; and each driver is performing a different maneuver such as turning left, turning right, merging, stopping or crossing through. This “One Second Advantage™” Safety Tip will help you understand “intersection etiquette” in order to responsibly and safely navigate intersections. Checking and maintaining proper air pressure levels in your vehicle's tires is one of the most important and easiest safety steps that you can take. Yet...consider this. A recent study conducted at a major university concluded that the majority of cars are being operated with tires inflated to only 80% of capacity. This "One Second Advantage™" Safety Tip will help you improve your safety performance and fuel economy by showing you how to keep your tires properly inflated. It's quick...it's simple...and it's the right thing to do to protect you and your wallet. 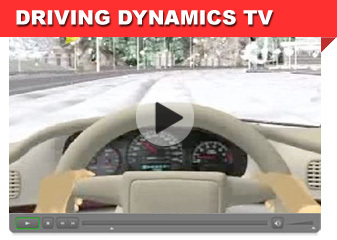 The biggest obstacle drivers are faced with - in snow and ice - is reduced traction. Since drivers never know when they may lose traction, by driving at slower speeds, they can react more easily to any changes in road conditions. This “One Second Advantage™” Safety Tip will help you improve your safety performance when faced with dangerous road conditions caused by winter weather.